The United States faces a converging public health crisis as the nation’s opioid epidemic fuels growing rates of certain infectious diseases, including HIV/AIDS, hepatitis, heart infections, and skin and soft tissue infections. Infectious disease and substance use disorder professionals must work together to stem the mounting public health threat, according to a new commentary in the Journal of Infectious Diseases. The article was co-authored by officials from the National Institute of Allergy and Infectious Diseases (NIAID), part of the National Institutes of Health, and the Institute of Human Virology at the University of Maryland School of Medicine in Baltimore. Since 1999, nearly 400,000 people in the United States have fatally overdosed on opioid-containing drugs, with 47,600 deaths in 2017 alone. Many people with opioid use disorder (OUD), who initially were prescribed oral drugs to treat pain, now inject prescribed or illegal opioids. High-risk injection practices such as needle-sharing are causing a surge in infectious diseases. Additionally, risky sexual behaviors associated with injection drug use have contributed to the spread of sexually transmitted infections. Infectious disease health professionals can play an important role in addressing the problem by not only treating a patient’s injection drug use-associated infection but also connecting the patient for treatment of their underlying OUD, the authors write. For example, coupling opioid agonist therapy, such as methadone, with treatment for HIV or hepatitis C, can prevent further transmission of those viruses and reduce opioid use. Comprehensive treatment will result in improved outcomes for both the infectious disease and the underlying OUD, according to the authors. Conversely, substance use disorder health providers should screen their patients for unrecognized infectious diseases and consult with their infectious disease colleagues regarding a comprehensive treatment plan. Substance use disorder professionals also should be aware of and direct patients to needle and syringe programs, which can decrease injection risks and provide an opportunity to provide other services as well. 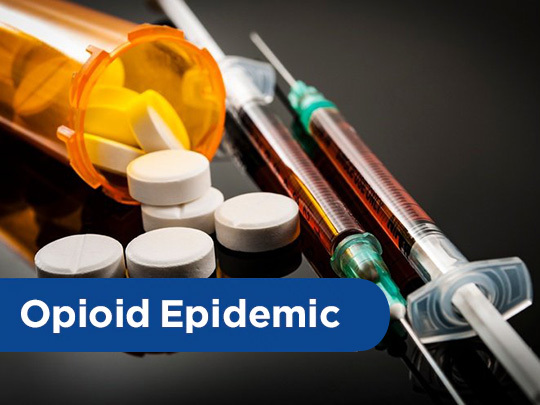 New federal resources made available to address the growing opioid epidemic can assist health professionals in improving and implementing coordinated, evidence-based strategies to prevent and treat OUD and opioid-associated infections. These efforts will be key to stemming and ultimately ending the intertwined problem of OUD and infectious disease, according to the commentary. TA Schwetz et al. Opioids and infectious diseases: A converging public health crisis. Journal of Infectious Diseases DOI: 10.1093/infdis/jiz133 (2019).